The Global Fatty Alcohol Alkoxylates Market is predicted to touch USD 787.8 million at a promising 5.0% CAGR over the forecast period (2016-2023). Fatty Alcohol Alkoxylates or FAA is a non-ionic surfactant which is made by the alkoxylation of the fatty alcohols by adding propylene oxide (PO) and ethylene oxide (EO). It is used across various industries such as Personal Care, Textile, Detergent Intermediates, Industrial and Institutional Cleaning and Household Cleaning. Its various applications include dispersion applications, emulsifiers and wetting agents. The fatty alcohols derived from the synthetic and natural routes of production are used for preparing Fatty Alcohol Alkoxylates. There are a couple of factors that is driving the growth of the Fatty Alcohol Alkoxylates Market. Some of the market trends and factors in this market as per an analysis conducted by Market Research Future (MRFR) include the demand for non-toxic and biodegradable surfactants from leading Fatty Alcohol Alkoxylates end uses such as I & I cleaning and household cleaning, growth of the personal care industry and migration and capacity expansion of cosmetic manufacturers to developing markets. Market Research Future report provides a comprehensive segmental analysis of the Fatty Alcohol Alkoxylates Market on the basis of Types and Application. Based on Types, it is segmented into Petroleum Based FAA and Oleochemical Based FAA. 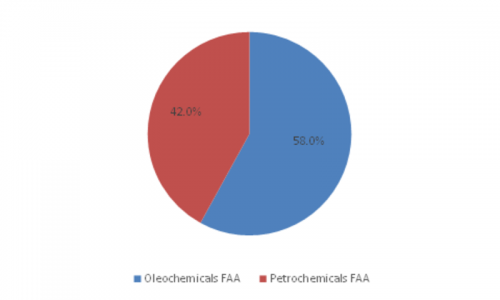 The petroleum-based FAA is further segmented into propylene oligomer alkoxylates, ethylene alkoxylate and olefin alkoxylate. The oleochemical based FAA is further segmented into Stearyl alcohol alkoxylate, stearyl behnyl alkoxylate, behnyl alcohol alkoxylate, cetostearyl alcohol alkoxylate and lauryl alcohol alkoxylate. Based on Application, the Fatty Alcohol Alkoxylates Market is segmented into personal care, textile, I&I cleaning, detergent intermediates and household cleaning. Based on Region, the Fatty Alcohol Alkoxylates Market covers growth opportunities and latest trends across North America, Europe, Asia Pacific, Latin America and Middle East and Africa. Of these, Asia Pacific dominates the market and accounts for about 40% of the share. The factors that account for the growth of the market in this region include rapid industrialization, urbanization and ongoing infrastructural development. In this Region, China has the maximum share followed by Japan and South Korea. It is North America that has the second biggest share with regards to volume and value. The regulations allied to the non-ionic surfactants’ toxicity and biodegradability in this region is a key factor that is driving the market growth. Moreover, the penetration of automatic dishwashers and front load machines in households coupled with the prevalence of laundromat services and auto wash centers here can further contribute towards Fatty Alcohol Alkoxylates Market growth in this region. The Global Fatty Alcohol Alkoxylates Market is highly competitive and appears to be extremely fragmented due to the existence of a good number of small and large players active within the regional market. Some of the key strategies that the key players in the market has adopted include expansion and merger and acquisition. Expansion and acquisition however were the second most commonly used strategy by the players. The companies indeed are building with distributors and local manufacturers a strong strategic partnership with an aim to cut down the gap amid the customer and supplier of the Fatty Alcohol Alkoxylates. Following the existence of key players and advancement in technology has made Fatty Alcohol Alkoxylates a profitable opportunity in their applications. Leading players profiled in the Fatty Alcohol Alkoxylates Market include Stepan Company, SASOL, Croda International Plc, Clariant International AG, KLK OLEO, Huntsman Corporation and BASF SE. Sept 2018- Oxiteno has started an alkoxylation plant recently in Texas having a capacity of more than 170, 000 tonnes per year. The plant will produce an array of specialty alkoxylates and nonionic surfactants. These products will be sold in different markets including paints and coatings, oilfield chemicals, personal care, institutional and industrial cleaning, home care and agrochemicals. March 2018- Specialty chemical maker BASF is all set in expanding its reach with a new facility in Texas. This facility worth $150 million will be devoted in the production of various ethoxylated products by mixing ethylene oxide in the substrate compound.